For the first time in more than four years, star-cross'd Greg Oden put on a uniform, entered an official NBA game, and dunked a basketball. His first thought? "It was a feeling of 'Get back on defense.'" Dec. 5, 2009, was a simpler time. The Blind Side ruled the box office, and John Mayer topped the album charts. (It was a dark time.) That night Oden fractured his kneecap, was carried off on a stretcher, and it seemed like we'd never see him again. 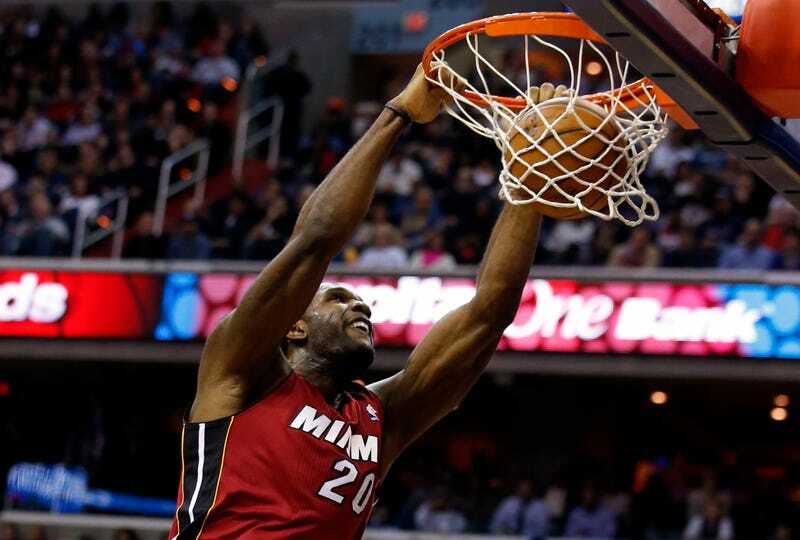 But several surgeries and 1,502 days later, Oden was a surprise participant in Miami's game at Washington. The Heat took a flyer on him, but other than some preseason action, he's seen no minutes this year. His activation last night was a matter of necessity. Mario Chalmers and Chris Andersen sat with injuries, and Joel Anthony was sent to Boston in a three-team trade earlier in the day. Toney Douglas hadn't arrived, so Oden was up. He came in early, with six minutes left in the second quarter. Why? "We were down by 30," Erik Spoelstra said. Just like old times. Actually, no. The old times were bad times, and tended to feature Oden lying in pain on the court, Oden standing with crutches, Oden swearing he'd return to the NBA. Let's hope these are new times, where Greg Oden can just be a big man off the bench and not a tragic time bomb.